We are mandated to leave the European Union, but we remain a European set of nations. There is enough inspiration in the European cooperative sector to embrace and improve all the connections we can. So, enough of nationalism now, after the referendum. How do you make change at a local level? The great Basque worker co-op, Mondragon, is investing in a model in the UK that aims to answer that question. Of course, everyone tends to have their defaults when it comes to making things happen, or putting up with things when they don’t. The model being worked up by the Young Foundation is interesting as it is a blend of the community development approaches of old (I have written about the inspirational work of Tony Gibson for example) and contemporary interests such as for social innovation. What is the same is a focus on understanding shared experiences, developing shared narratives and taking action together. What is distinctive is a more intensive initial research phase, using participatory and ethnographic research to hold up a mirror to people at a local level, coupled then with a matching phase of linking local people to local and national social innovations that could catch light. 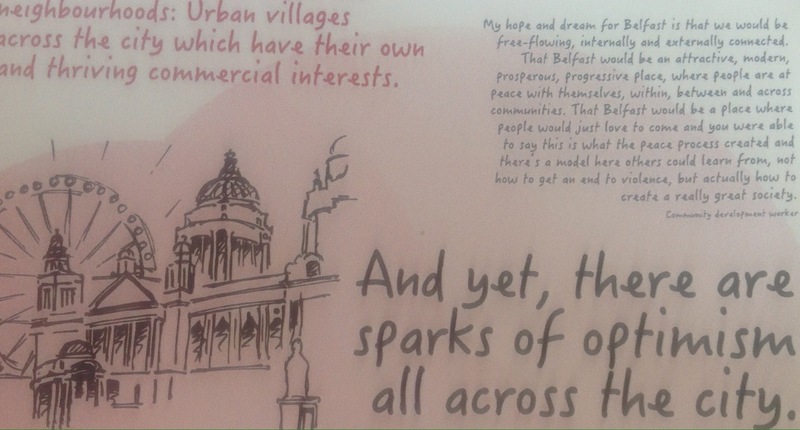 In Belfast and in Derry / Londonderry the approach, called Amplify, has started to link up local innovators and decision makers in what is hoped can become a social movement, coming together around a shared vision but building this into a network of shared ownership and innovation. It is early days, and there have been enough stop start attempts in neighbourhood regeneration and community organising to hold our breath before suggesting that this can change the world. It is an intensive approach, which may be a strength or a weakness. But it has ambition and is rooted in culture. That, rather wonderfully, is exactly the magic that Mondragon and the best of European co-operation can teach us. We are told that we have a choice between national sovereignty or EU membership, but I personally don’t buy that. If sovereignty is control over our own affairs, then we will potentially have less of it if we go it alone, because so many of the economic challenges that we face are ones that can’t be determined at a national level alone. They require international co-operation. I was sent recently the words below from the architect of the twin towers in New York. The vision he had was of trade that not only draws on international co-operation but nourishes it. Arguably, this was the same vision that inspired original European Coal and Steel Community… And the same vision of the Corn Laws campaigns out of Manchester in the nineteenth century. For the people involved, like Jean Monnet and Richard Cobden, exchange across borders was about open co-operation to widen prosperity and peace. If the answer that emerges from the UK referendum is not the European Union, then we will have to come up with something that is. We can’t duck the challenge of international co-operation. Else, our sovereignty will be the freedom to lose. Two women of extraordinary commitment and ability have been named recently for their work over decades in the cause of entrepreneurship. Dorothy Francis, chief executive of the co-operative development agency CASE in Leicester is the one and only person this year to be given a lifetime achievement Queens Award for Enterprise. And Dawn Whiteley, chief executive of the National Enterprise Network has been honoured with an MBE, again for services to enterprise. Their work has been at the front end of business support and advice. They are not the business leaders at the public helm of FTSE companies. They are business leaders in another sense, of having supported, nurtured and inspired hundreds of small and medium sized businesses, private business, social enterprise and co-ops, whatever works, whatever creates jobs, uses skills and expresses hope and opportunity. The origins of both institutions is also interesting as it is entwined. Many of the early enterprise agencies, as Adrian Ashton reminded me this week, were formed by the co-operative development agencies that already operated locally, from the 1970s. Just as, in later years, it was London co-operative development bodies that were the key force in the arrival of social enterprise agencies. Also linked are a few other progressive institutions. The story is told to me by one of the prime movers of the early enterprise agencies, John Davis. John, author of Greening Business, keeps in touch with me from our time together at the New Economics Foundation, when he was Chair of Trustees. His letter is below. Fritz Schumacher, author of Small is Beautiful and once named by Keynes as a preferred successor, asked John Davis, on leaving a global role at Shell in the late 1970s, to lead a programme on intermediate technology in Britain (the work of the charity Schumacher founded out of an Observer article, ITDG now Practical Action, had been focused overseas). John started work to support enterprise agencies – to catalyse and support local small business. One of the first was in St Helens, but there were soon many more: by 1981, 30 agencies. The model appealed to the Chair of Pilikington Glass, Sir Alistair Pilkington, who visited them and inspired him to found Business in the Community, explicitly to spread the practice across the country. Oh, it would be wonderful to see that noble charity return to those roots of practical community economic development, away from the back slapping world of social responsibility reports and awards. By 1986, there were 250 local enterprise agencies, but that was perhaps close to the tide turning. Rather than embedded micro-economics, government turned to a national advice agency, business link, and then when that failed to demonstrate the same track record (and yes, enterprise development is notoriously hard to evaluate, as this report from the state-endowed NESTA concludes), ditched it in favour of austerity-friendly websites, unpaid mentors and hopeful social investment. It is true, there is a different story in Scotland, where enterprise and community enterprise trusts have their own proud history – and to an extent also Wales, with the leadership of the Wales Co-operative Centre. People-powered prosperity is a recent book by David Boyle that tells more of the story of community economic development across the UK. 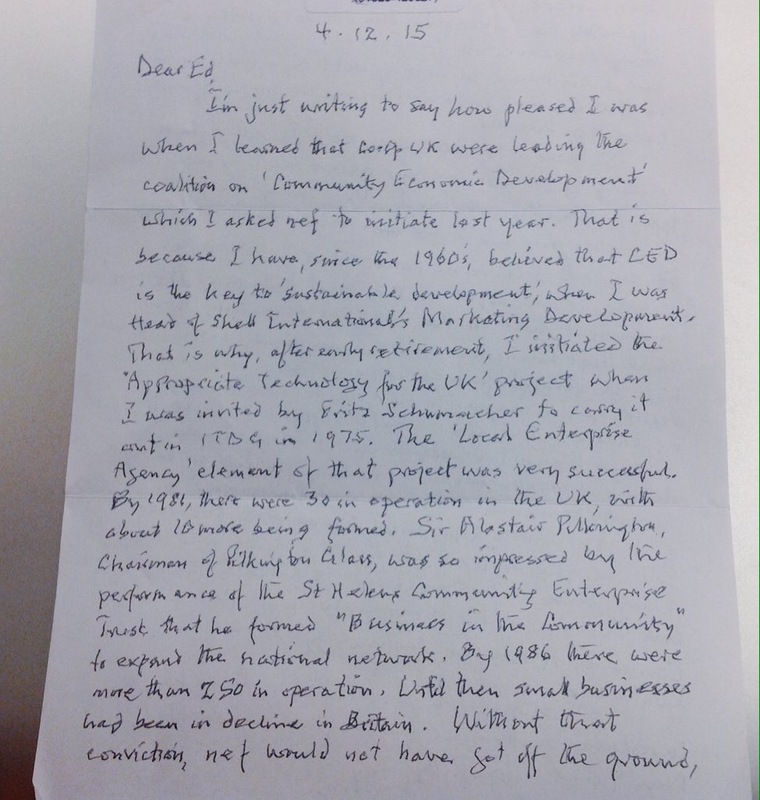 John was writing to me to welcome the new Community Economic Development programme we had launched with NEF, Locality and Responsible Finance (in liaison with many others, such as CLES and the Reconomy network), backed by the Department for Communities and Local Government. Through this we have supported fifty neighbourhoods across England with their community economic development plans, rooted in a holistic and participative approach to livelihoods and enterprise development. We are now in our second year, inspired by the communities we are working with. At national level, over three decades we have an extraordinarily patchy record of support for enterprise. But look at the story of Dorothy and Dawn. Look at the grassroots as the most innovative and persistent of enterprise, social enterprise and co-operative agencies still show us the way, if ever we wanted to move from an economy of dependence to one of true, mass entrepreneurship. Do raise a glass to Dorothy and Dawn. A country of shopkeepers? The suggestion, often attributed to Napoleon Bonaparte, was certainly made, in derogatory tones, two hundred and twenty years ago (on Saturday) in the National Convention in Paris. Bertrand Barère de Vieuzac declared Britain to be “une nation de boutiques”. The contrast I guess that he wanted to make was between a democratic republic and a market state. Although shopkeeping is probably a tougher livelihood now than then, there is one way in which the description holds. The UK is a nation of members – and many of these are member owners of co-operative and employee-owned retail shops across the UK. We have just released the UK co-operative economy 2016, annual data on the sector, which point to a significant increase over the five years in the number of members of co-ops. The co-operative and then we can add in also the mutual sector – powered by the likes of mass member owned high street businesses like the Co-op Group and Nationwide – form the largest part of the UK’s wider membership figures. This is going to get larger too. The Co-op recently relaunched its membership scheme, so that 5% of own brand purchases are returned to members, and 1% to their communities – and aims to recruit one million new members over the next period. Being a member of a club, a community or a cause is part of who we are. It is rare to find someone who does not belong to any group. It is also rare to find someone for whom being a member doesn’t also change, in subtle ways, how they interact with others and how they view themselves. There is such a thing as society, and membership is one of the building blocks. Membership, in fact, is part of a wider field of civic participation. You can sign a petition, click to like an online campaign or donate money. All these actions are part of a healthy democracy and are acts of citizenship, but they are not necessarily rooted in membership. Because the term ‘membership’ is used in so many varied, and sometimes shallow ways, we have also done some research on what the public thinks count as proper membership. offer them opportunities to get involved. What underpins this, in terms of social psychology, appears to be that great forms of membership are ones that offer identity and control. There has never been a Doomsday Book for members in the UK, so this is far from the final word. What are the next fifteen? Or fifteen hundred? Our intention has been to open up the conversation on membership, rather than close it down, and we would be delighted to find others. In England and Wales, for example, the Charity Commission estimates that there are around 80,000 charities that have a membership structure. These come in different forms. A number of the disability charities have members, often with a democratic model where members are able to vote on who gets on the governing board (even if that the board remain in formal terms trustees of the charity rather than directors acting as representatives of member interests). In the disability field, over many years, this shift has been key to the move away from a tradition of paternalism, acting ‘for’ people with disabilities to a model in which action is led by people with disabilities. The great participatory slogan has been ‘nothing about us, without us’. The New Citizenship Project, led by Jon Alexander, is working with six associations on the theme of the future of membership organisations: Amnesty International, Soil Association, NASUWT, Tate, National Union of Students and House of St Barnabas. This looks a fresh and contemporary version of an exploratory venture with fourteen membership charities coordinated by Katherine Hudson for NCVO with the RSA a few years back. So, how many members are there in the UK? Just drawing on our top fifteen membership networks, I conclude that there are over ninety one million in total. Not surprisingly, there are more members than people in the UK, because we are members many times over. But still, this is a dramatic number – for comparison, it is ten times the number of individual shareholders in the UK. Can we imagine the television news, where member ups and downs were treated with the same profile and respect as stocks and shares? With technology platforms making it easier and more cost-effective to operate membership systems, members are likely to be part of national life for years to come. With ninety one million memberships and rising, we are a nation of members. Note: An expanded version of this blog was first published by Democratic Audit – I would welcome additions you may have to this list of top membership organisations and will credit you. What is missing?